Today’s commercial real-estate market is highly competitive and moves quickly. 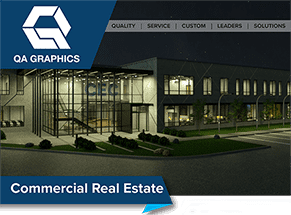 QA Graphics can help by providing you with professional, premium site plan design, and space planning for commercial properties with a variety of graphic options and 3D representations at a fraction of the cost of traditional architectural firms. Floor Plan Layout/Fit From basic to complex designs we offer high-quality floor plan graphics, quick turnaround times, and the technical expertise to include building details such as zoning, windows, built-ins, furnishings, and more. Site or Navigation Maps This option is great to showcase a whole campus, a single building, or a single floor, allowing you to see the potential space of a new building within the site. Interior & Exterior Renderings Using existing 3D assets we can create renderings that are photo-realistic, including lighting, fixtures, landscaping, fittings, and finishes. Customization With a high level of detail, your layouts can be as simple or as detailed as you wish – placing furniture, flooring, lighting, textures, paint colors, dimensions, and more. A fit floor plan in medium grey tone floors with white walls sharply defined doors and stairs. A fit floor plan that has realistic details shown in floors & doors while walls remain monochromatic. A layout floor plan with monochromatic floors, medium definition of doors & stairs shown in grey tones.